Travel Notes is a translation of Notatki z podrozy by Stefan Nesterowicz. In 1909 Stefan Nesterowicz was sent as an agent by the weekly Ameryki-Echa (Echoes of America) to the south and southwest of the United States to visit Polish settlements. He published his writings as Notatki z Podrozy in the next year. His journey covered four states: Arkansas, Louisiana, Mississippi, and Texas. Nesterowicz’s original Polish version and the English translation by Marion Moore Coleman (1969) have been out of print for many years. The Board of Directors of the Polish Genealogical Society of Texas began the journey to bring this all important work of Stefan Nesterowicz to the forefront of our society. After exploring several avenues with concerns of copyright, it was decided to turn to linguist, Elizabeth McNeilly, for a new beginning with an original translation. Photographs included only in the 1910 publication have been extracted, enhanced and included in this new book. This fascinating translation will be available on November 11, 2007. The cost per book is $17.95; Texas residents must include $1.48 sales tax. Postage and handling: $3.50 for one book or $4.50 for two. Reserve your copy by sending in the order blank below. Make your checks payable to: PGST and mail to P. O. Box 820386, Houston, Texas 77282. Download Travel Notes order form. You may also pay online via secure PayPal site. A PayPal account is not required. 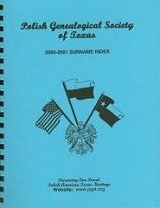 Polish Footprints is the award-winning periodical of the Polish Genealogical Society of Texas. 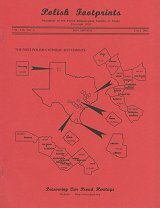 Published two times a year (Spring and Fall), Polish Footprints contains articles to assist Texas and Polish research as well as general genealogical research. Books reviews and activities of other societies are announced. Various topics helpful to the researcher of Polish ancestors are also published. Current issues of Polish Footprints are sent to all members. The cost of these issues is included in the membership fee. A limited number of back issues are available from Summer 1984 to present. All Special Editions listed above can be purchased separately. Inquire at PGST Back Issues for price on back issues and Special Editions. EVERY periodical the PGST published before 2009 is now available in digital format. This covers 1984 through 2008, including special editions. Also included is a Table of Contents listing each periodical and the Surname Index for 2008-2009. PGST is offering this for a special price of $50.00 in the format of your choice. This is a substantial savings when you consider that a hard copy of each periodical cost $6.00 or more and the Special Editions cost $14.00 each. Download periodicals DVD/CD order form. A database search of names mentioned in our periodicals is also available. A Surname Index is available on-line. Use this searchable index to find others researching similar ancestral lines. Included is contact information, surnames being researched, ancestral origins, year of immigration and where settled in the U.S.